With new labs, classrooms, more learning and living space, engineering and medical students coming to class at the University of British Columbia’s Okanagan campus will get their education in some of the newest, state-of-the-art classrooms on any post-secondary campus. 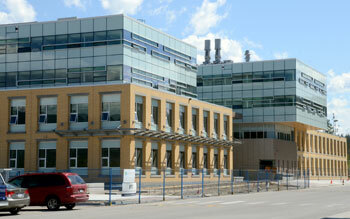 The School of Engineering building (Engineering, Management and Education Complex) and the Purcell residence building both opened with return to classes this week, while the Health Sciences Centre will be ready for the first intake of 32 students in the Southern Medical Program early in the New Year. The educational buildings incorporate the latest in high-tech teaching tools from lectures being delivered on huge screens from anywhere in the world to the newest energy-saving technologies. The new structures use geothermal process to heat in the winter and cool in the summer, as do all of the academic buildings on campus. At 186,000 square feet, the $68-million engineering facility is one of the largest projects undertaken as part of the campus master plan. 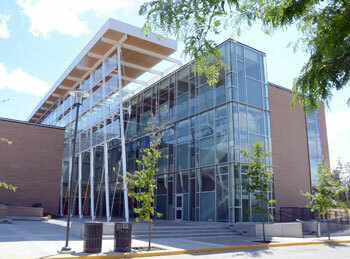 Besides housing the School of Engineering, the complex also plays homes to the Faculties of Education and Management. Along with a geothermal system, the building also features a glass atrium to provide space for students, faculty and staff from all three programs to socialize, study, and interact. A green roof and low-flow fixtures will provide 40 per cent savings over conventional systems. Multipurpose classrooms, project rooms and laboratory facilities are designed to bring students together through cross-disciplinary learning opportunities. The Health Sciences Centre is a $31-million, 47,000-square-foot building that includes high-tech classrooms and lecture theatres, small-group teaching rooms, research and teaching laboratories, administration and faculty offices and linkages to campus infrastructure. Numerous measures in heating, cooling, exhaust air heat recovery, heat pumps and fans are expected to result in use of 49 per cent less energy than a conventional building. One of the unique features of the building is the distance-learning technology which includes a massive screen –14 metres across – that can display up to four video feeds at the same time. This allows for live lectures from other centres to be shown from anywhere around the world, and include multiple subjects. Students can participate in Faculty of Medicine lectures in Vancouver, Victoria and Prince George through push-to-talk microphones and camera technology. 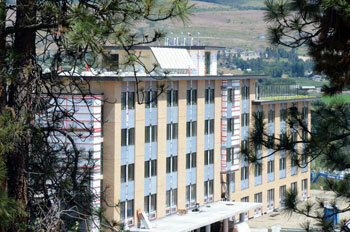 Students have also moved into the new $14.9-million Purcell Residence, with 212 beds. This brings the total number of beds on campus to 1,648 to meet the needs of out-of-town students. The Purcell also features a green roof, solar heating panels, occupancy and window sensors and heat-recovery ventilators. The building performance has been estimated to be 48.7 per cent better than a similar building built to the minimum levels of the Model National Energy Code. Additionally, storm water is collected and discharged into an onsite retention pond, where the water is treated through natural measures and emptied only through evaporation.